Let me start by stating I'm no pro at what I do. I just enjoy sharing how I do it. My methods may not be considered correct or they could be!? I'm just going to tell you how I do it. First things first. When your working with natural stone from bulk or a pallet you need to gather all the largest stones and put them aside early on. If you don't you will be un-happy later. This image show all my cap stones I been stockpiling. This wall is 20" high to the top. So what I'm doing is build to about 16" +/- . 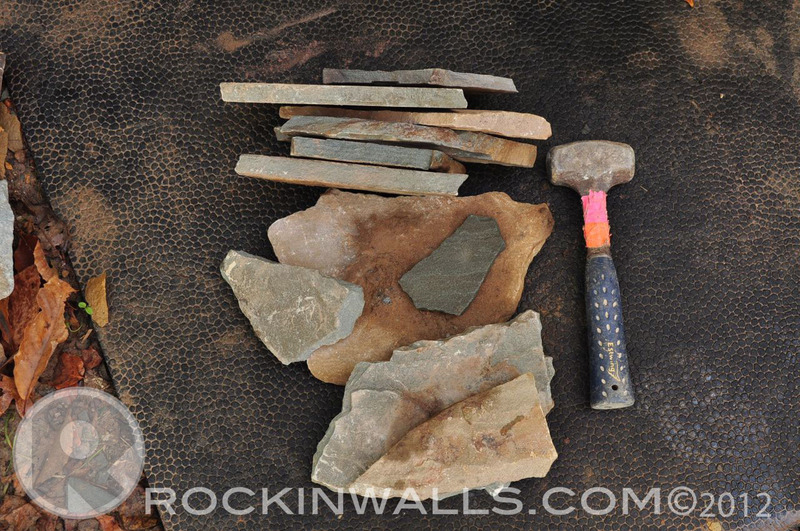 The reason for this is because with the natural stone caps I'm using they very from 2-6" in thickness. By building the wall to a point below my top string line this gives me the room I need to work backwards. What I mean by this is that you find the cap stone you plan on using. I'll set it on the wall then measure down from the string line or my top of wall mark. 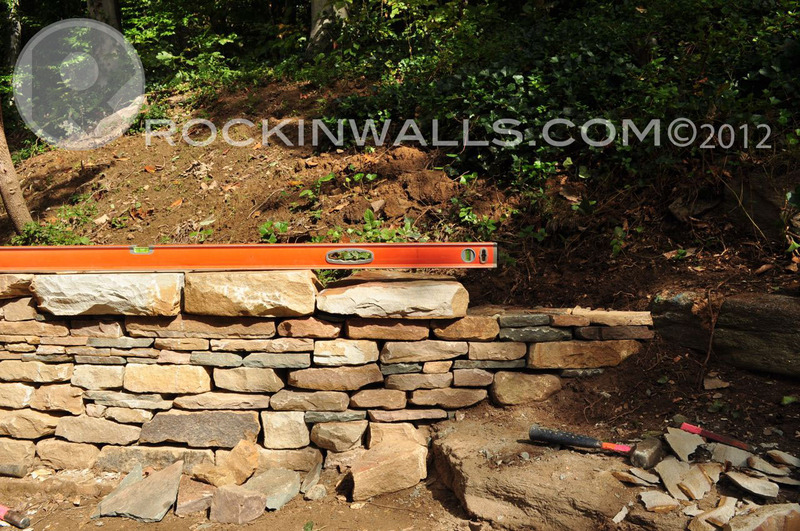 (a 8' level is being used in the photo) Next you must fill the void between the wall and the cap stone. 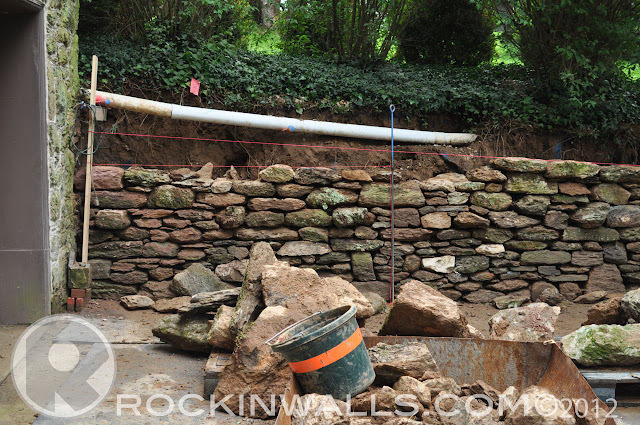 Looking at this photo I can now measure the space then find the correct stones to get me to my height. Some times to keep it easy I'll just set the stones on top the cap to see if I now touch my string line. I also keep a pile of small plates at hand. 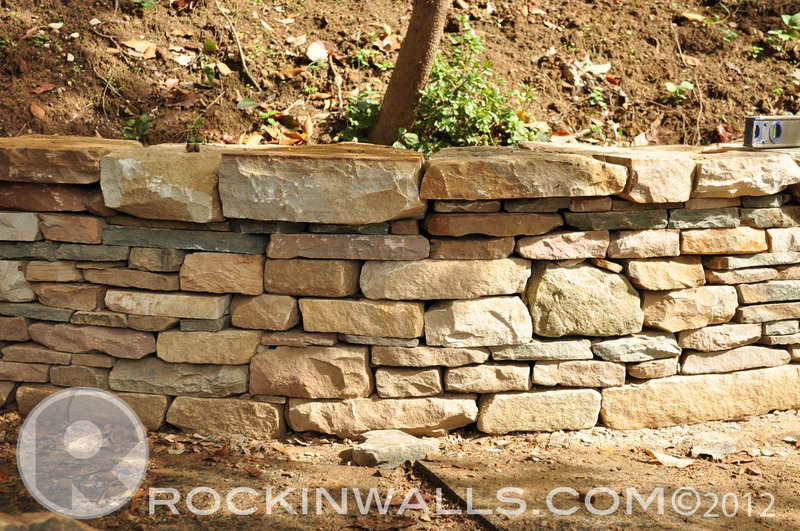 Some times plates can be hard to come by depending on the kind of stone your using. The plate stones I use to get my height. I always keep my plates close to my wall frames making them easy to find when I'm ready for them. You can see different sizes of my caps stones in this photo. You can also see how I use small stones as I'm moving down the wall to get to the right height. As I call it working backwards. Your no longer building up the wall. Your now building backwards. You will also see a bit more then the 1 over 2 or 2 over 1 rule. You can see a 4 over 1 running joint. But little hard to void this sometimes. All rules are meant to be broken with the large cap next to a small cap. Do I have much of a choice. - Not really just need to run with it. This photo I'm running two lines one to keep my wall level the next for my caps stones which run up hill. I'm building up to a place where I then find my cap. Then work backwards to find the right stones to fill the space under the caps. In this photo I have placed three stones on the corner I want to use. Setting caps are like doing flat work you still need to make sure they match well next to one another. As I'm moving down my wall I some times use a brick with string to my rebar. This wall has a level top. 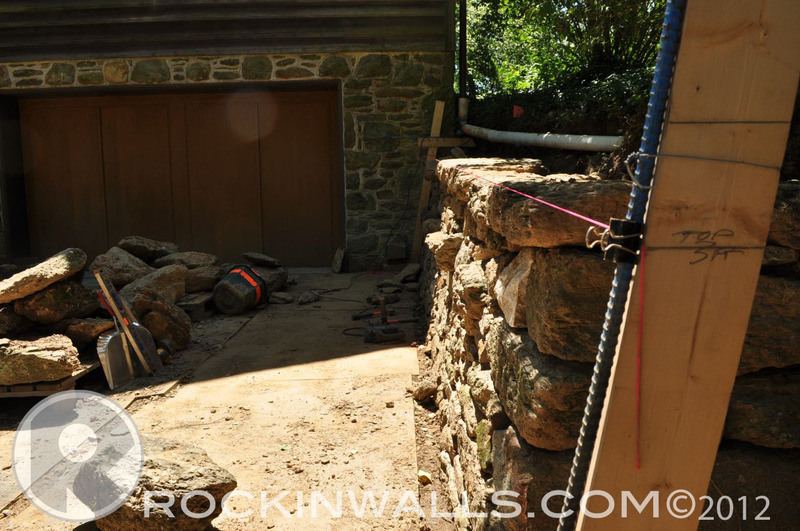 I'll place several cap stones to the string line then move my brick and keep on building. Brick with string line wrapped around it. By moving the brick down the wall this will limit the chance of having a hi-spot in a stone which causes your line to be out of level. 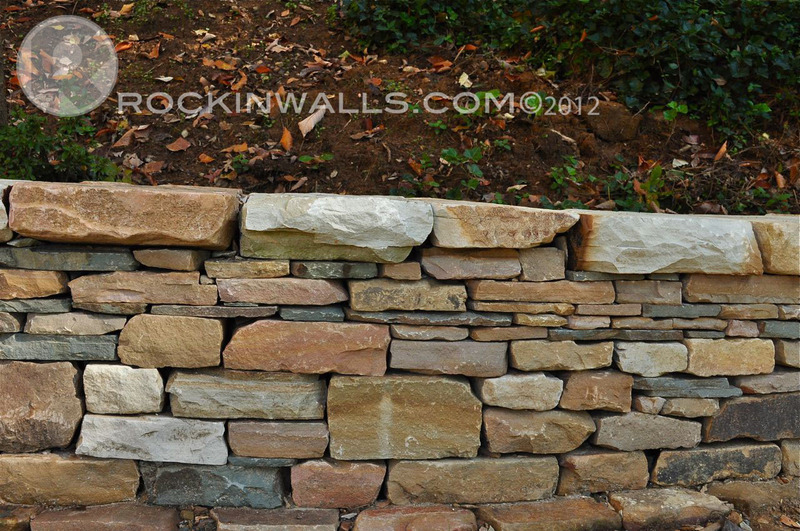 Just look at those cap's now look below them to see what stones I used to work backwards. 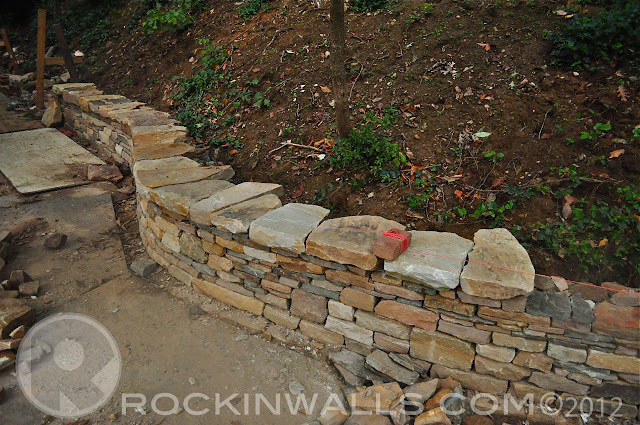 Wall-la - flat cap stones. 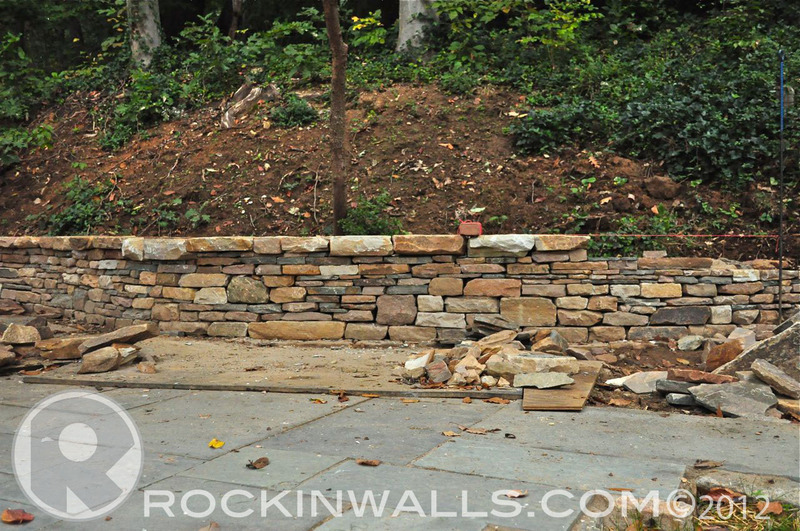 Wall shown in photo current build 10/12 Roland Park, Baltimore Maryland. Stone used on this job. 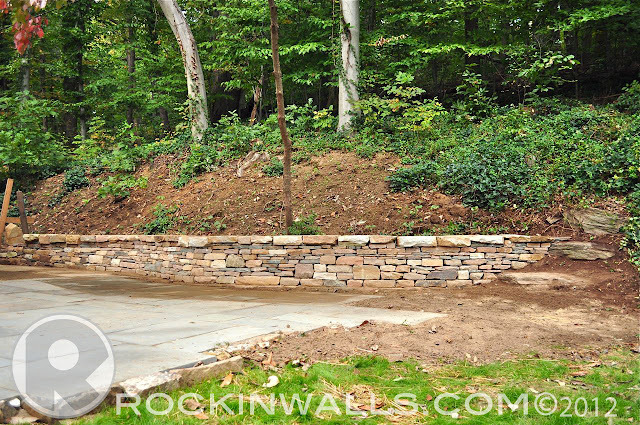 Western Maryland stone mixed with PA Blue stone. Color of stones brown, tan, red, cream and blue - mat colors. Labels: Flat cap stones, Western maryland stone. You're a pro all right Mark. I use the same techniques. 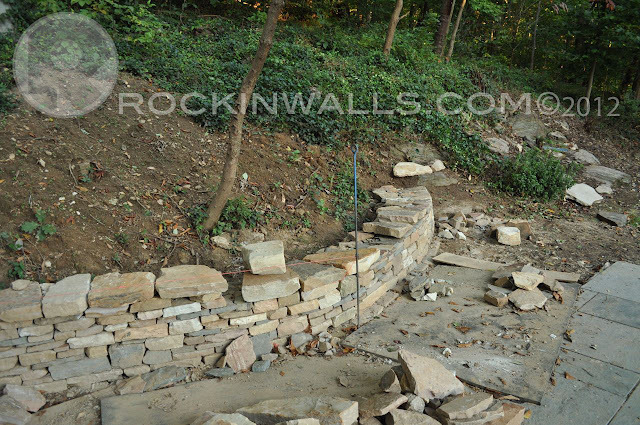 Just finished over 80 feet of retaining wall with flat copes of various thickness. It makes me a little nutty too- worrying over the compromises when you have to accept mini running joints due to placement of the shim plates. (the great Sean Adcock made me feel a bit better when he mentioned that breaking the rules are okay if you know your breaking them and why! I don't know about the pro part. Your right about making you a little nutty. Love to see some pics of your latest work! I can see Sean saying that too. Thank you for you comment..Dan. I'll ditto the pro comment. You do great work and you get paid to do it. Pretty much meets the definition of pro in my books. Great pics and great play-by-play explanations! OK Ok your right a pro does get paid for there work. Glad you liked the play by play explanation. This is so helpful! Thank you for taking the time to make your knowledge available. 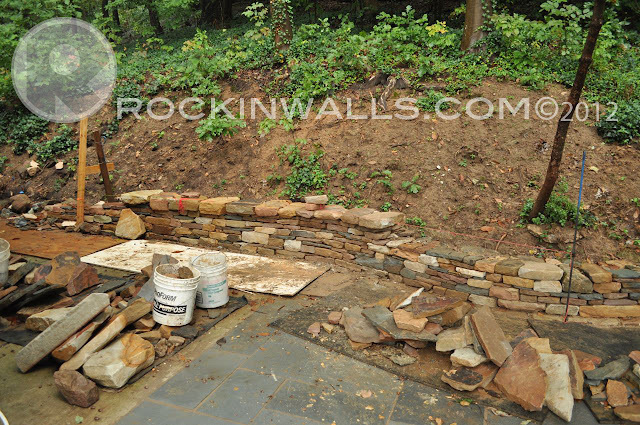 I just built my second dry stack stone retaining wall (2'x2'x44') and am in the capping process. "Experts" are telling me I need to mortar the caps and can use the mortar to level them. 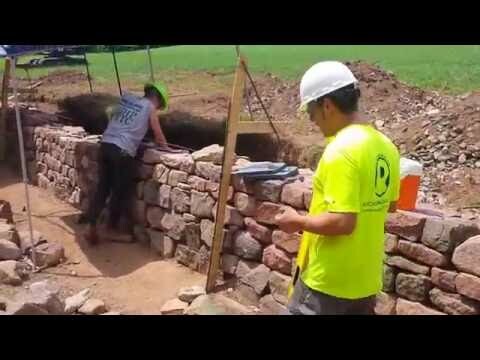 I like the look without mortar and see from your walls how to make them level without using mortar--and that dry caps work! Margaret, I'm glad you found the topic helpful. Those who don't understand the proper methods just don't get it. You can use mortar if needed. The downside you do run the risk of water getting into it and causing it to fail. As a good friend told me you never want something stronger then the stone or it will fail. So if you had to go with something to help hold it down a Type N mortar would be ok choice. I'd rather build it all dry. 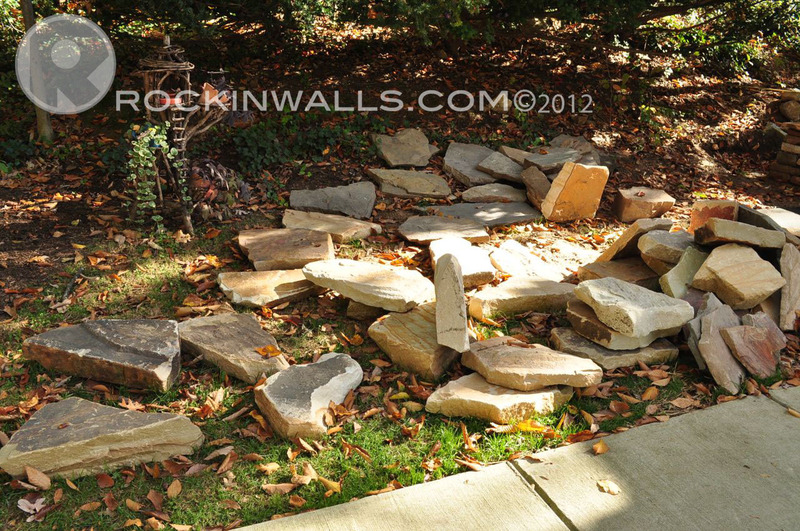 I would only consider a mortar or a paver glue if childern might be running on the wall. But if you build with heavy caps you will never have the chance of one falling off. Every cap on every project I build as shown on my blog is dry laid. I'd love to see photos can you send them over to me. Thank you for commenting. Nice to know get feedback.